Canadians bought 115 McLarens last year, up from 25 in 2015, the marque's first full year here. VANCOUVER -- McLaren Automotive expects to continue its strong growth in the Canadian market this year, tracking the British supercar maker’s rapid global sales expansion. 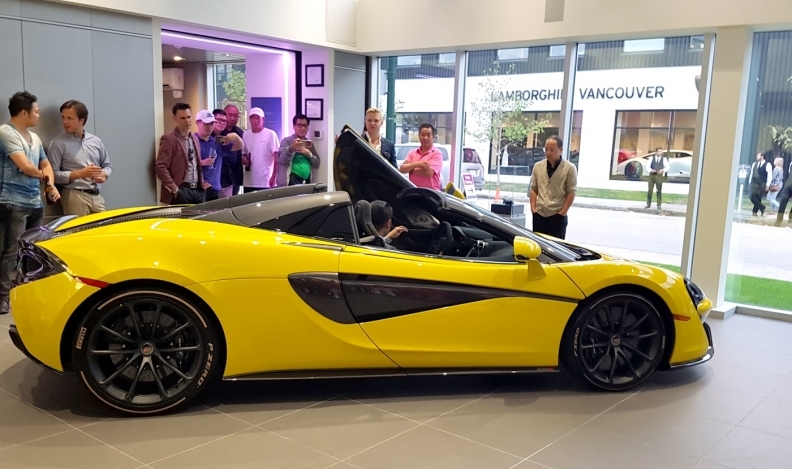 Canadians bought 115 McLarens last year, up from 25 in 2015, the marque’s first full year here, said Morris Lubinich, general manager of McLaren Vancouver and leasing manager for Pfaff Auto, McLaren’s Canadian distributor. “We expect to be about 150 this year,” Lubinich said during McLaren’s national unveiling of its new 570S Spider. McLaren sold about 1,000 units in the U.S. last year. Worldwide sales were almost 3,300 last year, roughly double 2015 sales as it expanded its line of low-slung, race-inspired supercars. The new Spider, whose twin-turbo V-8 can propel the car to 100 km/h in 3.2 seconds, has a base price of $247,500. Lubinich said he expects about 90 per cent of 570S sales to be Spiders. The McLaren line ranges from the $196,500 540C to the $315,000 720S. Most roll out the door with options worth about 25 per cent of the sticker price, said Pfaff marketing director Laurence Yap. Besides competing with the likes of Ferrari and Lamborghini, Lubinich said some of McLaren’s growth is coming from customers moving out of sports cars such as the Porsche 911 Turbo and Audi R8.